A merger between Bermuda’s two opposition parties moved a step closer with senior figures on both sides admitting they are open to discussion. The Bermuda Sun understands that the proposed merger would spell the end of the United Bermuda Party in its current form. Bermuda Democratic Alliance leader Craig Cannonier was meeting with the party’s wider membership last night to discuss the way forward and admitted “all options” were on the table. 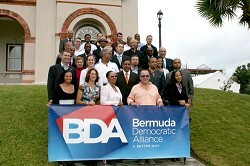 The United Bermuda Party’s central committee will meet tonight for its own internal discussions. If the merger does go ahead, say insiders, it would mean a new party with a new constitution. Internal elections would have to be held for leader and deputy leader. 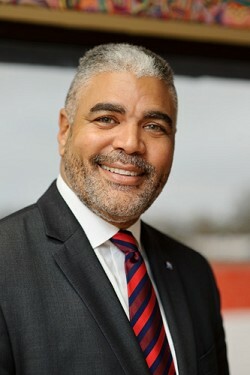 Mr Cannonier, who had been one of the more outspoken critics of the UBP calling on them to ‘turn out the lights’, was initially thought to be against a union. But he said yesterday that his party was ‘talking’. “We are confronted with the opportunity of deciding what is best for Bermuda. We’re meeting with the membership to talk, have some questions go back and forth and measure the options that lie before us. Mr Cannonier added that it could not be a case of the BDA ‘rejoining’ the UBP as many of its members, including himself, had never been part of the UBP. United Bermuda Party sources say the party is open to a genuine merger. One senior figure said they accepted the BDA were bringing a slew of new talent to the table including people who would not have considered joining the old UBP. Some party stalwarts are understood to be against ditching the UBP name and ethos. But it is believed that the majority of the key players on both sides share enough common ground to make the merger happen. The PLP has remained aloof from proceedings but senior party figures said they found the whole saga comical. A party insider said that whatever the outcome of the talks both the BDA and UBP would emerge from the saga with their credibility in tatters. “It’s just ridiculous. What have they achieved? You can’t have credibility saying you are one thing one minute and something else the next? “Didn’t Craig Cannonier say the UBP should turn out the lights? Wasn’t Kim Swan saying BDA stood for betrayal, deceit and abandonment? He said a name-change would make no difference.